In the late 19th and early 20th centuries, flag-raising ceremonies at schools were seen as an important way of promoting patriotism and allegiance to the British Empire. 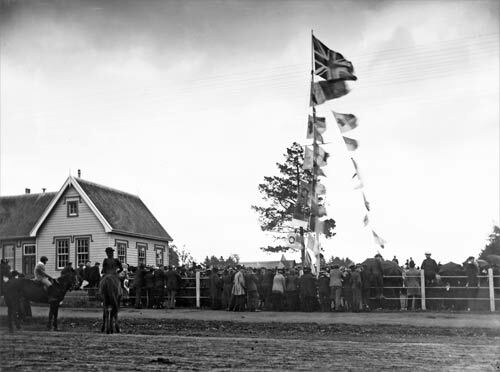 As this photograph of Ōtāhuhu School, Auckland, around 1900 shows, the ceremonies were a major school and community event – even passers-by on horseback have stopped to watch, and some pedestrians have climbed the fence to get a better look. The Union Jack continued to be flown at schools after the New Zealand Ensign was adopted in 1902.